I dedicate this website in the heavenly realms to Lord Jesus who is my everything, and who my three-year-old “Miri”, my inner Divine Child, absolutely adores. In the earthly realms I dedicate this website to my husband of 55 years, Herb Schaffer, Rab SoSo. He is financing the TAO Humor Center and has supported me through all phases of my growth. He went to four summer clown camps with me and took storytelling, juggling and improv. 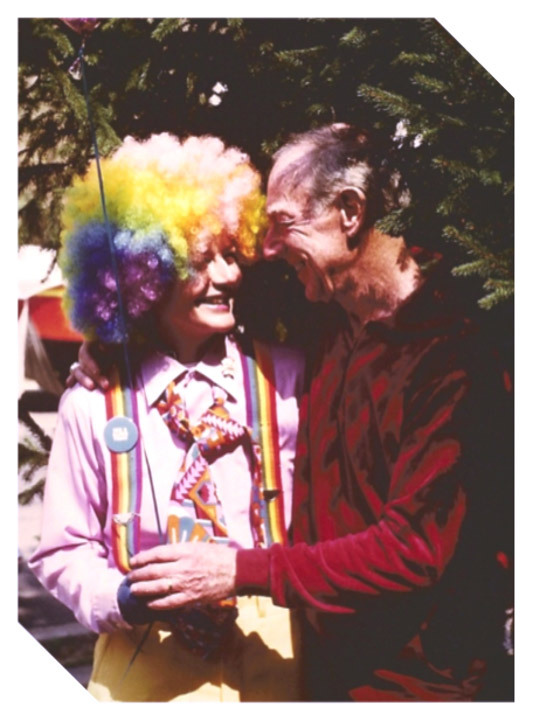 He has participated in clown events and chauffeured around many clowns. Herb took a large number of the photos used in this website. Even though it was not “his thing,” he even got certified in Reiki I and II and served on the Arlington Virginia Hospital Reiki healing team as my partner. He has always enjoyed life and appreciated his gift of life. While I seem to fly around in other dimensions, he grounds my work. He was glad when I became a clown, saying “Well, I finally understand this!”. And for the future, I dedicate this website to all children past, present, and future. May we all meet together in God’s Heaven on Earth, dancing, playing, and singing — SOON!